Making something from hand is such a rewarding experience, be it sewing, knitting, crochet, needlework, workwork or any other number of handiwork crafts. I found this video really interesting, and how Renate talks about knitting being a form of meditation rang true with me. 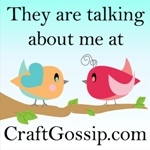 I know anytime I am crafting, I am lost in my own little world, and it does feel very meditation like. I also liked the importance she placed on handicrafts within our busy, modern (often cold) world. Crafters, and others interested in any kind of handmade skill, do yourself a favour and watch this great video. Thanks for sharing. Yes I do feel like I am doing something with my hands and yes, sometimes I do meditate. Photo: A monster for a monster lovin' kid! Feedback from our Crap I've Made giveaway winner!